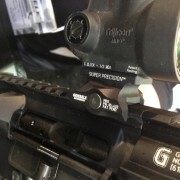 Geissele showed off their new Trijicon MRO QD Mount. The mount will be available sometime in the summer. The black version will retail for $99 and the DDC version will be $124. The post [SHOT 2016] Geissele MRO QD Mount appeared first on The Firearm Blog.